DoubleHeader was one of the first Vicious Circle members that Dragon brought in upon his arrival with the Chicago Police Department. It was not long before he broke loose, taking advantage of the mass breakout from Stronghold Penitentiary that took place shortly after the arrival of Dart on the police force. Shortly after his escape, DoubleHeader briefly joined up with the Annihilators before returning to action for the Vicious Circle. He was one of the killers sent by OverLord to assassinate CyberFace when he was being held prisoner by the police. These villains were all arrested but DoubleHeader escaped during the prison breakout that his previous intended victim had orchestrated when CyberFace took control of the Vicious Circle. 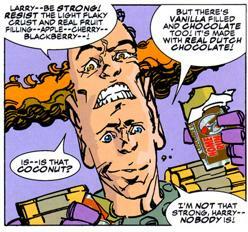 DoubleHeader was one of the dozens of villains sent by Horde to murder Dragon and was shrunk down in size by a Martian weapon. He spent years in this miniaturised state until Vicious Circle scientists eventually restored them all to their normal state. DoubleHeader remained with the villainous group. When Mako began gathering an army to take on Solar Man, DoubleHeader was present but he opted out of the assault. This was a wise decision as the attack force was almost entirely wiped out. When Dragon is later sent to prison, Doubleheader is seen as one of the inmates. He is also one of the many super-freaks who brutally beat Dragon while in prison.